Cast brass, inlaid with copper and silver. A seated Buddha with right hand in bhumisparsa mudra, touching the earth, denotes the moment before his Enlightenment when he called upon the Earth to witness his overcoming of the forces of Evil. Left hand on lap with palm upwards. Purchased from Mrs. A.M.Stodart, from whom it had formerly been on loan. 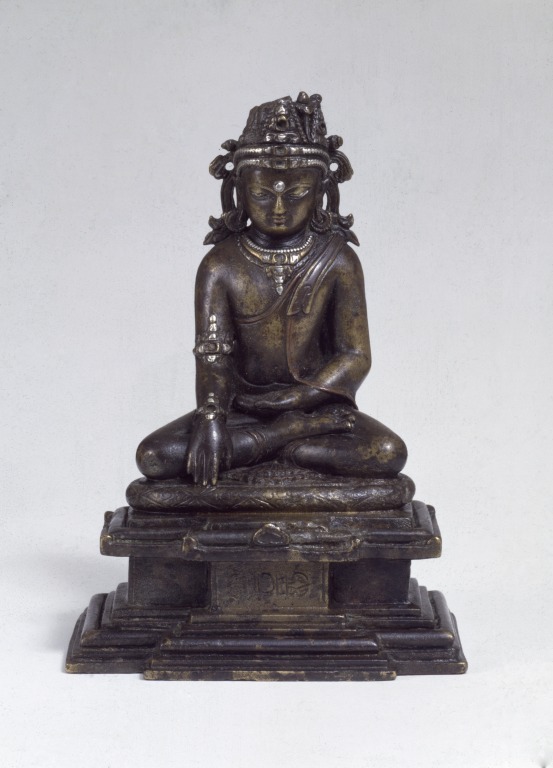 According to a note in the 1966 V&A Register this Buddha, described as 'North India (Mahayana Buddhist); 11th-12th century', was 'Dug up near Congeeveram (the ancient Kanchi) in the Chengalpat district, Madras Presidency, having been buried probably in the 13th or 14th century', in common with V&A Museum numbers IS.44-1966 and IS.45-1966. 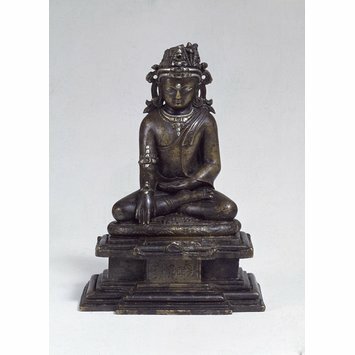 "This finely modelled figure closely follows eastern India sculptural models of the late Pala period (c. 10th-12th century). It was reportedly excavated near Kancipuram, in Tamil Nadu, southern India, prior to 1917. There was considerable mobility of images in the Buddhist world; another Burmese sculpture has been excavated at Nagapattinam, a major Buddhist centre in coastal Tamil Nadu." John Guy. The crowned Buddha at Bodhgaya, cast brass, Bihar, Eastern India, 12th century. Skelton, Robert and Mark Francis eds., Arts of Bengal, text by Robert Skelton, John Lowry, Andrew Topsfield, Veronica Murphy and Susan Stronge, London: Whitechapel Art Gallery 1979, p.27, no.15.